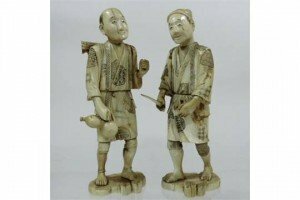 A pair of Japanese Meiji sectional carved ivory figures of men, one holding an axe, the other a water bottle, with a rucksack on his back. 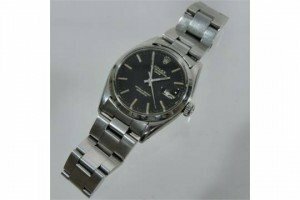 A Rolex Oyster Perpetual Date Chronometer steel cased gentleman’s wristwatch, the black dial with baton hours, on a flexible strap. 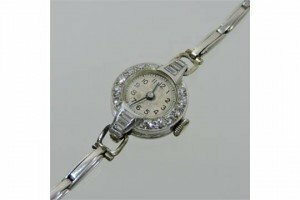 A 1920’s platinum and diamond cased ladies cocktail watch, the arabic dial surrounded by twelve stones, with three further to each side, on a flexible strap. 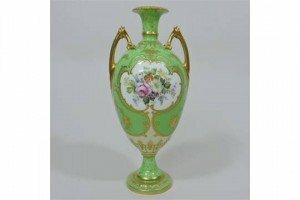 An early 20th century Royal Crown Derby porcelain vase, of ovoid pedestal shape, reserved with panels of coloured flowers, on an apple green and gilt ground, printed marks to base. 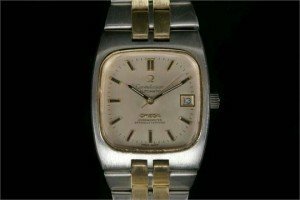 A gent’s Omega Constellation automatic wrist watch, in two tone stainless steel and gilt finish, silvered date dial and tapering two tone bracelet. 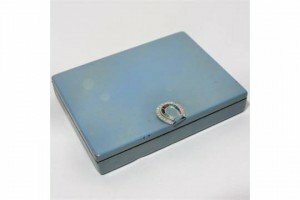 An early 20th century Cartier blue enamelled silver gilt ladies powder compact, of rectangular shape inset with a mirror, with two hinged compartments, the sliding horseshoe shaped clasp set with diamonds, emeralds, sapphires and rubies, London 1935. 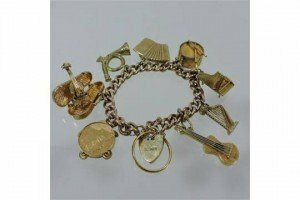 A 9 carat gold curb link charm bracelet, set with a 22 carat gold band and eight various mainly musical charms, including a miniature cased violin, with a 9 carat gold padlock shaped clasp. 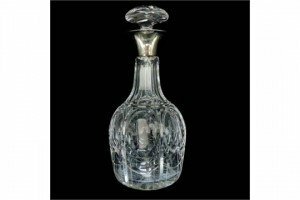 An early 20th century silver mounted cut glass decanter and stopper, of mallet shape with a star cut base, Birmingham 1913. 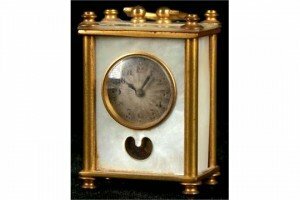 An Edwardian gold plated and mother-of-pearl miniature desk clock, having silvered dial and Arabic numerals. 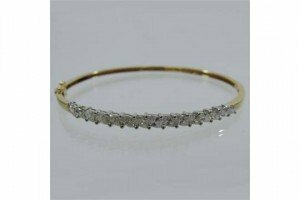 An 18 carat gold diamond set hinged bangle, set with a single row of fifteen marquise cut diamonds. 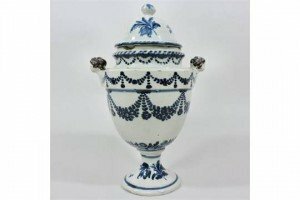 An early 19th century Delft blue and white vase and cover, of urn shape, flanked by a pair of handles in the form of heads with manganese hair and a later domed cover. 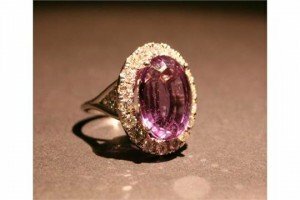 An 18ct White Gold Large Amethyst and Diamond Ring, with an oval amethyst surrounded by diamonds within a pierced setting. 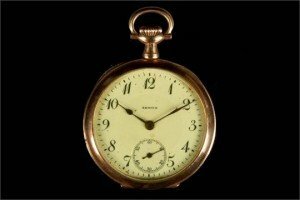 An early 20th Century 14k gold cased Zenith fob watch, with Arabic chapter dial, sub-seconds dial and fan engraved case back. 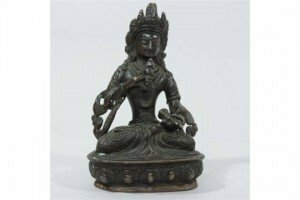 A South East Asian bronze figure of a seated Thai Buddha, with crossed legs, on a shaped plinth base, incised with a flowerhead to the underside. 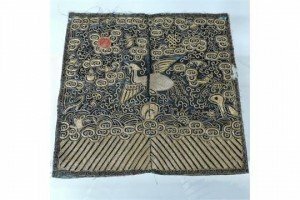 A Chinese Qing dynasty Mandarin square or civil rank badge, the woven metallic thread depicting pheasant flying towards the sun, amongst stylised clouds and above waves. 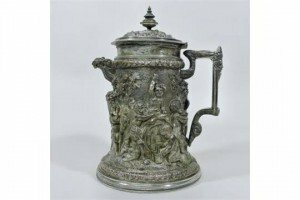 An ornate 19th century German silver plated jug, of cylindrical form with a hinged lid, decorated in relief with putti and amongst scrolling foliage, with a gilt interior. 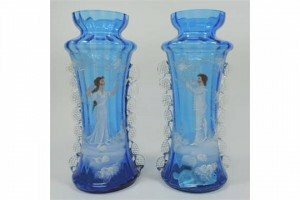 A pair of late 19th century blue glass vases, each enamel painted with a figure, in the manner of Mary Gregory, with clear trailed glass decoration. 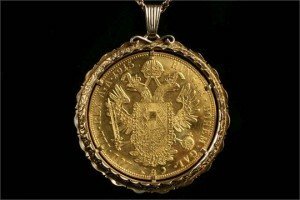 An early 20th Century Austro-Hungarian gold coin, in a gold and seed pearl mount, with a 9ct chain. 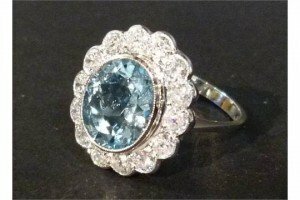 An 18ct White Gold Aquamarine and Diamond Ring, set with a large oval Aquamarine surrounded with diamonds. 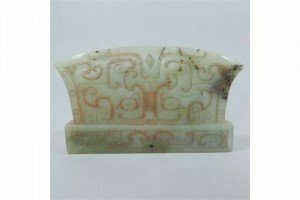 A Chinese jade coloured stone axe head, with russet and black inclusions, carved throughout with geometric stylised scrolling designs.